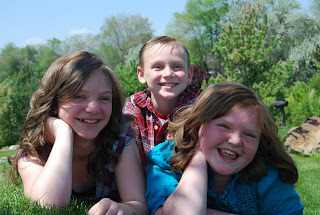 Yesterday we took all of our kids and Nicole out to get some new pictures of them. We took them to some local spots and had a lot of fun. Alissa said the best part was she got to see the Koi fish. Dawson couldn't get enough of sticking his hands in the water... he thought that was pretty cool on a hot day. Haley and Nicole were excited that I took them to get some fun shots against the "grafitti wall" here in town. It is the only wall in town the has a full size mural on it with some fantastic colors. We got some pretty fun shots but I'm not able to share them all otherwise you may have to sit through a 10 minute slideshow. We are hoping to get some fun "beach" shots soon but needed to wait until after the Memorial Day weekend...the sand dunes are CRAZY this weekend.